You are here: Home » Category: "Display Manager"
In a heavily populated drawing you can accumulate alot of annotation tags and it can become quite difficult to see what they actually are attached to. You can easily display the link between the tag and the parent object by some simple Display Representation manipulation. Lets get started! First we need to start the display manager by either typing DISPLAYMANAGER at the command line or by selecting it on the Manage tab of the ribbon. In the display manager expand the Sets node of the tree and scroll down until you come to the current active display set. This will be the text highlighted in bold. 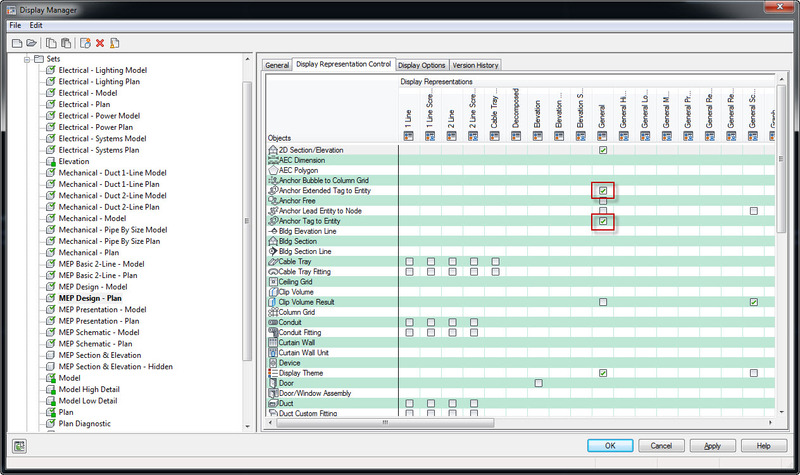 Select the active display set and in the right hand side select Anchor Tag to Entity and Anchor Extended Tag to Entity under the General Column as shown in the picture below. Press Ok to update the changes and you now have a drawing that shows the anchor relationships between tags and the objects they are attached to!